Karachi (Agenzia Fides) - "We must promote peace through friendship and communion among young people who belong to various religions, ethnic groups and cultures. Art and culture can be a useful tool to promote unity, peace and social harmony among young people", said Kashif Anthony Javeed, coordinator of the National Commission of Justice and Peace (NCJP) of the Archdiocese of Karachi, speaking at a recent seminar on "The role of young people in the promotion of peace and harmony" organized by Caritas Pakistan in collaboration with the NGO "Christian Social Services". Kashif Anthony said: "You young people must be active citizens and work for the promotion of unity, peace and harmony". Young people, he stressed, "are the real leaders of change in society and young people can play a vital role in the nation". Fr. Asif John, a Catholic priest, noted that "the key factor for the life of young people is education, which allows us to play an important role in the development of a good society". Education not only facilitates our learning, our knowledge and our capacities, but it also generates a peaceful mind and personality". And he said that "in order to bring peace into society it is essential to fight against the presence of injustice and corruption". John added: "By living the values of love, hope, unity, peace and respecting each other, young people can easily cultivate unity, peace and harmony in our society by offering an example of coexistence among people of different faiths". Mansha Noor, Executive Secretary of Caritas of Karachi, said: "Peace is an urgent need for Pakistani society. The country is not only fighting terrorism, but also discrimination and ethnic and religious violence". 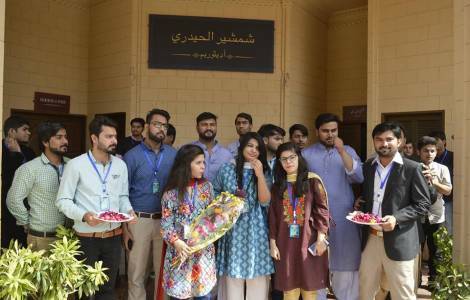 'Youth for Peace project' was launched by Caritas Pakistan to reach out to young people and train them to be authentic builders of peace. Our mission is to train young people to be heralds of peace and harmony".